3 min read . Updated: 06 Sep 2016, 04:52 PM IST Nidheesh M.K. Bengaluru: When regional television channel Manorama News polled its viewers to find “The Newsmaker" of 2015, the public gave their vote not to actor Nivin Pauly or one of the state’s veteran politicians, but to a man perceived to be an incorruptible cop. 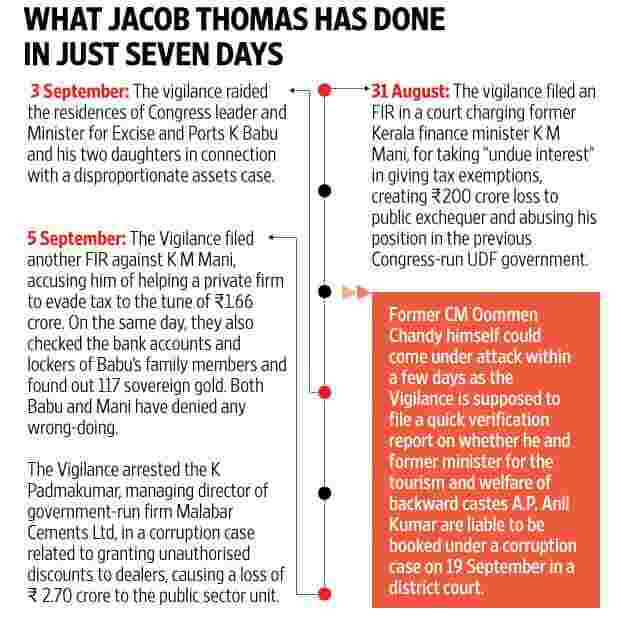 Days after assuming office as Kerala’s chief minister in May, Pinarayi Vijayan made that IPS officer—Jacob Thomas—the chief of Kerala’s anti-corruption wing, also known as the Vigilance and Anti-Corruption Bureau. Thomas has been going after big names and ruffling feathers since then. In the past week, his crackdown on graft created fresh troubles for politicians, government officials and private companies. And he seems to be in no mood to stop. “I’m not afraid," the 56-year-old officer, ranked at the level of Director General of Police (DGP), said by phone from Kerala. “The drive will continue as long as I am heading the vigilance bureau." Thomas, who is from Kottayam district, has a long history as an anti-corruption crusader, which has often meant going against powerful people. Each one of his previous postings has been as newsy as this one, despite attempts by successive governments to push him out of real policing and force him to spend most part of his career in non-police departments, such as horticulture or ports. But even by his own standards, the last two years, when Kerala was ruled by the Congress-led United Democratic Front, were particularly controversial. In July 2014, posted as additional DGP in the vigilance department, he led anti-corruption raids against top government officials, which led to strong action, including the suspension of an Indian Police Service (IPS) officer. Soon after Thomas was involved again when a scam broke out—later to be dubbed the “Bar Bribery scam"—in which senior Congress leaders and then finance minister K.M. Mani were rumoured to be involved. But when Thomas started probing the scam, he was moved as head of the Fire and Rescue Service (FRS) department, which led to a furore. However, immediately after taking over the FRS, Thomas went against prominent apartment builders, citing violations of central government rules on fire safety. Within four months, he was again transferred, following which he publicly locked horns with then chief minister Oommen Chandy. A first rank holder in agronomy studies from the Indian Council of Agricultural Research and an author of seven books on management and leadership, Thomas has said on several occasions that to be in key positions in the civil service, one needs to be corrupt these days. “One can become a chief secretary only if there are at least three Vigilance FIRs (first information reports) pending against him," he said last year. “If I were knowledgeable about the civil services, I would have never come," he said in a more recent interview. Now that he has got the power to do what he long wanted to, Thomas says he is practising “creative vigilance" in his new role. The concept of “creative vigilance", he Thomas, is to prevent corruption from happening by identifying the loopholes in the system rather than just going after the offenders after the act. He explained this concept to journalists on the he took over as vigilance director in June by brandishing a yellow card and a red card. “Imagine I am a referee. Yellow will be my first warning, the warning of creative vigilance. Red will be for those who do not pay heed," he said. The Hindu reported after the press meet, “Mr. Thomas said he had spent several months building police facilities. Now he was no more a builder. He was more of a demolisher who would take down corruption brick by brick." This week, he sent letters to various government departments seeking details of financial transactions made by political leaders and their investments in private and cooperative banks. Many expect the vigilance department under him to conduct raids on big private financial institutions as well. How much of a free hand Thomas is given under the new left government in Kerala remains to be seen—as he seems to be going after politicians of all hues, and not just those on the opposition benches, said an IPS officer and friend of Thomas who did not want to be quoted.